Vertical blinds will give you privacy plus the control of the sun and light that come into the room, they are also low maintenance. 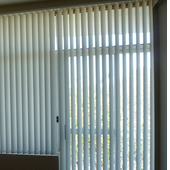 The Vertical blinds come in two size blades the 89mm & 127mm, they also come with or without chains at the bottom of the slats. Our Vertical Blinds come in a variety of fabric, materials and colours.